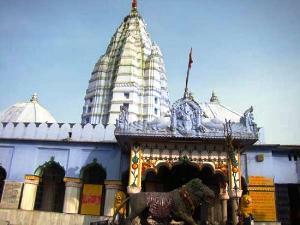 Samaleswari Temple is a Hindu temple in Sambalpur, Western Odisha, India dedicated to the goddess known as 'Maa', also known among the natives as samalei maa, meaning Mother Samaleswari. Shree Shree Samaleswari, the presiding deity of Sambalpur, is a strong religious force in western part of Odisha and Chhattisgarh state of India. On the bank of the river Mahanadi the mother goddess Samaleswari is worshipped from ancient times as Jagatjanani, Adishakti, Mahalaxmi and Mahasaraswati. The region in which the temple is situated has a rich cultural heritage. Sambalpur region is popularly known as Hirakhanda from ancient times. Ptolemy has described the place as Sambalak, according to Tavernir, the French traveller, and Edward Gibbon, the English historian, diamonds were exported to Rome from Sambalpur.The temple is of Sandhara order. It is built of a kind of stone durable as granite, cemented with lime mortar, the whole building is plastered, but in the course of time the surface has become mouldy. The temple comprises two separate structures. The square sanctum sanctorum enshrining the deity is four step below the 10-foot-wide (3.0 m) covered circumambulation, which is supported by 12 stone pillars. Eleven parswa devis (side Goddess), are embedded on the outer wall of the sanctum, so that the devotees can worship those deities during parikarma through the vaulted circumambulation. The Idol of Shree Shree Samalai Devi consists of a large block of Granite rock with an inverted, trunk like projection at the bottom. A shallow cut on her “Baraha” like face symbolises her mouth. Traditional Sambalpuri nose ornament of pure gold hangs down from her imaginary nose Beaten gold leave fixed on two disproportionate golden eye like depression on the face acts as substitute for her eyes in an attempt to define the face of the mother deity on a mass of self shaped rock, the devi’s idol inspires sublime sentiments of awe, fear, reverence, devotion, love and affection towards all-pervading motherhood.